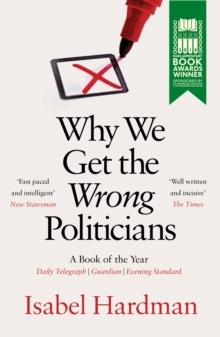 Shortlisted for the 2018 Waterstones Book of the YearWinner at the 2018 Parliamentary Book Awards"A really good book... Well-structured and well-written." Observer"Well written and incisive." The Times"Vital and compelling." New StatesmanIn an era when politicians are responsible for the Brexit logjam and embroiled in sexual-harassment and expenses scandals, it's no wonder we've lost our faith in government. Every year, they introduce new legislation that doesn't do what it sets out to achieve - often with terrible financial and human costs. But, with some notable exceptions, they are decent, hard-working people, doing a hugely difficult and demanding job. In this searching examination of our political class, award-winning journalist Isabel Hardman investigates the strange and demanding world of Westminster, and asks why we end up with representatives we no longer trust - and how might faith be restored.